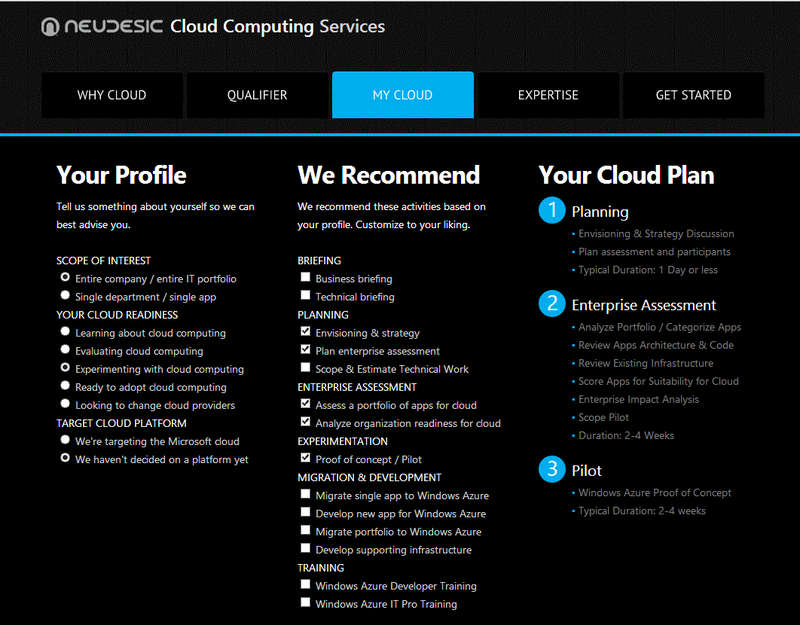 Neudesic has relaunched its cloud assessment site, http://cloud-assessment.com.Neudesic was the first to have a comprehensive Windows Azure-specific cloud assessment offering, and we're now launching version 2 to reflect a more mature Microsoft cloud platform and a more sophisticated market. 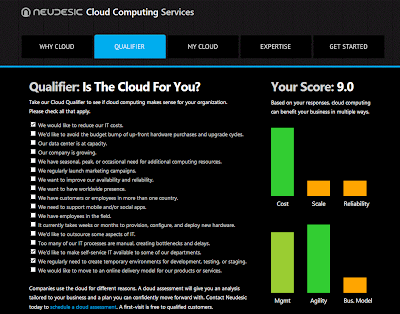 The first thing you'll notice about the new cloud assessment site is that is it HTML5-based. It can be used on tablets as well as desktop browsers. 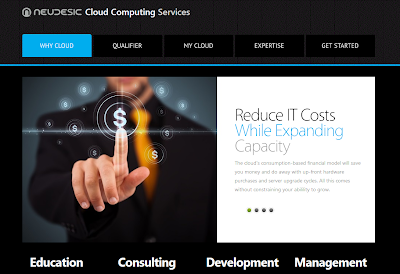 The site includes a cloud qualifier, which provides some quick feedback on likely cloud value based on answering some simple questions such as "We would like to reduce our IT costs" and "We want to have worldwide presence." Businesses use the cloud for different reasons, so it's important to tailor interest in cloud to specific benefits important to your organization. 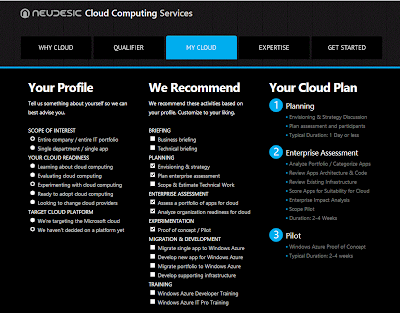 Services we provide for cloud include briefings, cloud assessments, pilots, migration, new development, and training. The breadth and substance of those have changed over the last few years. 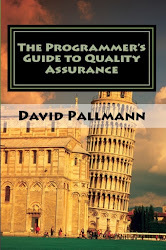 Historically, that meant the following: briefings were usually for a technical audience; cloud assessments were most often a one-day affair where a single app was analyzed for cloud suitability; pilots, migrations, and new development needed to be estimated; and training meant 2-day developer training. All of this of course had the Windows Azure platform in view. Today, we are still all about Windows Azure but the platform is much broader, including both IaaS and PaaS services. In cloud assessments, many customers these days are expressing interest in a generic cloud assessment that does not assume what the cloud vendor and platform will be. Lastly, many enterprises are interested in assessing not a single app but some or all of their IT portfolio. These are some of the drivers in overhauling our cloud service offerings, process, and online tooling. Today, we offer two distinct lanes of cloud services. For a single department / single app focus, a briefing is a lunch-and-learn; an assessment is a one-day visit that includes an architectural design session and scoping of a migration. For a company looking at cloud at a high level where their entire IT portfolio is in view, a briefing includes both an executive briefing as well as a technical one; an enterprise assessment involves 2-4 weeks and can be generic or Windows Azure-specific as desired. In an enterprise assessment, we interview application stakeholders, categorize apps by platform and other criteria, and analyze cloud suitability for groups of applications. This includes an enterprise impact study which takes into account process impact, infrastructure impact, and cultural impact of introducing the cloud. For either level of engagement, a pilot or proof-of-concept is typically 2-4 weeks in length. Engagements for migration and new development need to be custom-estimated. We offer Windows Azure training for developers and/or IT professionals, which can span 2-5 days based on coverage. For companies needing bulk migration of dozens or hundreds of apps, we offer our Azure Migration Factory service which provides highly-efficient low-cost migration by leveraging parallel teams of offshore consultants supported by subject matter experts. In the My Cloud area of the site, visitors can see a custom cloud plan based on their scope of interest (company-wide vs. single dept. / single app) and where they are in their cloud readiness (education, evaluation, pilot, adoption, looking to change cloud providers). As in the past, an initial visit is free to qualified customers in the markets we serve. 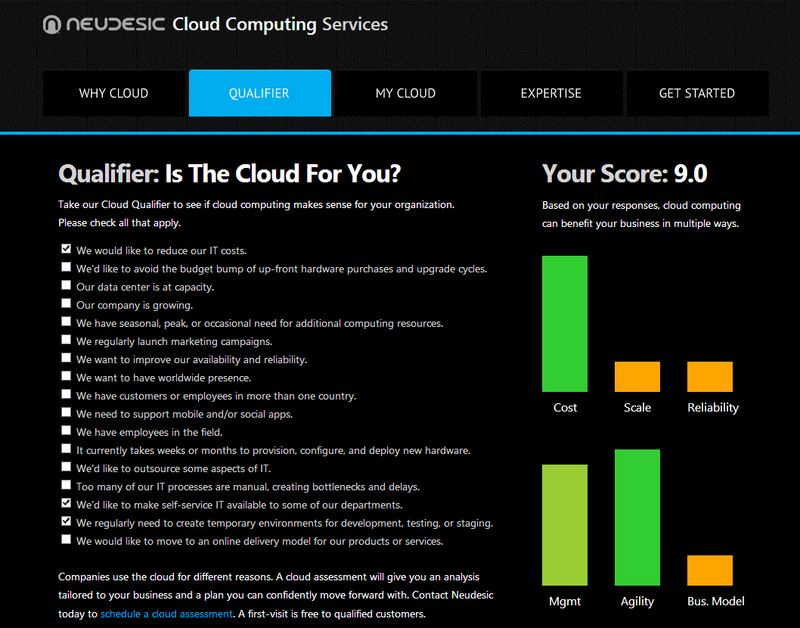 The updated cloud assessment site is part of a larger initiative where Neudesic is updating its many online cloud properties. Stay tuned for more.